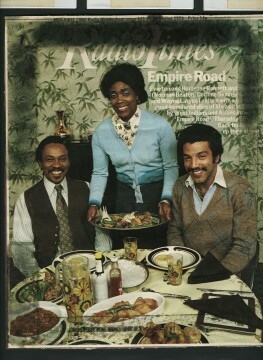 ‘Radio Times’ front cover from 1976, courtesy of Janice Rider, who was the costume designer on ‘Empire Road’. ‘Empire Road’ was the first black soap opera in Britain. It was produced at Pebble Mill by Peter Ansorge. It was written by Michael Abbensetts, and starred Norman Beaton. ‘Empire Road’ was shot in Studio A, and on location in Handsworth.